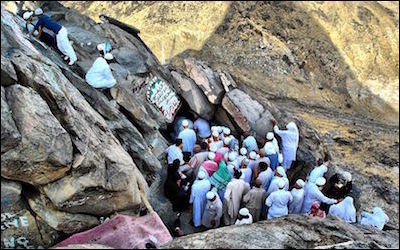 The Cave of Hira on the "Mountain of Light," the site where Muhammad is said to have received his first revelations from God. The rulers of Saudi Arabia have announced a new program for cultural renovation of architecture associated with the life of Muhammad. 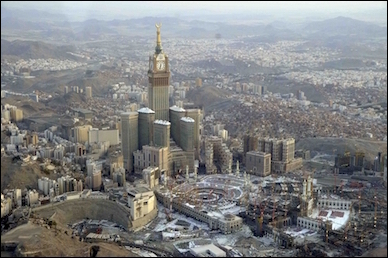 As described in the leading pan-Arab daily Asharq Al-Awsat, a Saudi Commission for Tourism and National Heritage (SCTH) has begun planning rehabilitation of sites in Mecca, the direction of prayer for Muslims around the world, and Medina, which includes the Prophet's Shrine, where Muhammad is said to be buried. The restorations would include Jebel Al-Nur, the "Mountain of Light" in Mecca, where Qur'an is believed to have been first revealed to Muhammad, and locations where he is said to have sojourned. Jebel Al-Nur is a key topic in this discussion. In Medina, sites identified with battles fought by the Muslims, and four early mosques, are due for reorganization and restructuring. Museums drawing on Islamic military history and other themes will be opened and guides to the attractions provided. The endeavor has been endorsed by Prince Sultan bin Salman, the 60-year-old son of the current ruler, King Salman. Prince Sultan is best known for having traveled in 1985 on the U.S. space shuttle Discovery. SCTH president Saad Al-Rashed will head the undertaking. If carried out, the effort will represent a break with the doctrines of the Wahhabi sect that has maintained a close alliance with the Saudi monarchs for more than two centuries, and is the official Islamic theological dispensation in the desert kingdom. Wahhabi iconoclasts have been infamous as wreckers of the heritage of Islam and other religions. They argue that protection of architectural assets, including sacred structures, is "idolatry" prohibited by Islam. Those so accused are judged to have abandoned Islam and are subject to execution. The Saudis and Wahhabis invaded and sacked the Shia Muslim holy cities of Karbala and Najaf in today's Iraq, following the emergence some 250 years ago of Muhammad Ibn Abd Al-Wahhab, the preacher for whom the fanatical creed is named. This violence against Shias, whom Wahhabis condemn as alleged apostates from Islam, and their monuments was repeated frequently. To the Wahhabis, the contemplative traditions of Sufism constitute another form of "polytheistic apostasy," along with Shia Islam, in that Shia and Sufi adherents alike honor Muhammad and other spiritual figures, rather than Allah alone. Wahhabis zealously condemn ritual respect paid even to outstanding Muslims. In their zealous condemnation of ritual respect paid to outstanding Muslims, Wahhabis further decry such practices as an imitation of Christians, for the love the latter show toward Jesus. After the Saudi conquest of Mecca and Medina in the mid-1920s, tombs in the sacred cemeteries housing the remains of Muhammad's family and early companions were levelled. The same addiction to demolition was seen in the Taliban assault on the Bamiyan Buddha statues in Afghanistan in 2001, and in its most spectacular form, on September 11 of that year, in the wrecking of the World Trade Center towers and the crash of a hijacked jet into the Pentagon. Those structures were additionally viewed as "idols" by the Wahhabis of Al-Qaida. In an excess of metastasized Wahhabism, these destructive urges are visible in the devastation of the pre-Islamic legacy of Palmyra in Syria last year by the terrorists of the so-called "Islamic State" (ISIS), who also blow up Shia and Sufi installations. The Saudi regime seems to have decided suddenly to adopt a new perspective on the matter, having hitherto neglected to restrict Wahhabi interference with Islamic heritage. "Saudi modernization" is a convoluted process at best. While the house of Saud long allowed the Wahhabi clerics to hinder visits to Islamic religious sites, they did not censure as "idolatry" the recent erection of grotesque and garish hotels and malls surrounding and dwarfing the Kaaba, the black stone cube at the center of the Grand Mosque of Mecca, and the ground where Islam originated. Seen from above, the Kaaba is now a tiny structure far overshadowed by a Stalinesque clock tower. To facilitate construction of the clock tower, an entire hill and the Ottoman fortress on which it sat, protecting the Grand Mosque since Ottoman times, were bulldozed. King Salman Bin Abd Al-Aziz, in power beginning last year, and succeeding his half-brother, the reforming King Abdullah, promised after he ascended the throne that he would continue on the path of positive change pursued by Abdullah. Of course, real social reform—allowing women to drive, for example—is impossible without curbing the power of the Wahhabi clerics. Despoliation of Islamic historical structures is the most obvious symbol of Wahhabi radicalism. The blind Wahhabi Grand Mufti of Saudi Arabia, Abdul Aziz Ibn Abdullah Bin Baz [1910-99], known for his intransigent views, issued two fatwas against participants in Muslim pilgrimages to Mecca visiting and praying at places traditionally seen as appropriate for such devotions. In the first, Bin Baz opined that walking up Jebel Al-Nur to a cave known for Muhammad's revelation was a "means leading to [polytheism]," and must be banned. The restriction is not enforced, but the steep climb up the steps of Jebel Al-Nur, in raging heat, is daunting to most pilgrims. The second such fatwa by Ibn Baz was more sweeping, and summarized the Wahhabi hostility to historic preservation. It stated, "It is impermissible to exaggerate the importance of historical sites and buildings, because this might lead to [polytheism]. The laypeople may be tempted to believe that such places are blessed, and be driven to commit acts of disbelief. . . . It is, therefore, obligatory to neglect and abandon such a deed and to warn against it." The "acts of disbelief" execrated by Ibn Baz consist of commemorative prayers to Muhammad and other Muslims deemed virtuous. Arab media reporting on the new Saudi approach to the Islamic legacy lack any reference to three of the most controversial issues involving the cultural legacy of Mecca and Medina. These are the identification and reconstruction of houses in Mecca, in one of which Muhammad was reputedly born and another where he is thought to have lived with his wife Khadijah; ongoing Wahhabi demands for a desecration of Muhammad's tomb and shrine in Medina by removal of an Ottoman dome constructed over it, and rebuilding of the cemeteries obliterated in the 1920s. The latter subject produces annual protests at the Royal Saudi Embassy in Washington, mainly by Shia Muslims. Why have the Saudis now adopted a public stance in such contrast with the Wahhabi mischief that lasted so long? Prince Sultan is famous for his "correction" of Ibn Baz, who preached as unchallengeable Islamic dogma that the earth was a flat disk around which the sun rotated. Challenged on this medieval view, Ibn Baz did not hesitate to argue that being blind, he believed the evidence of his feet rather than what others told him. After his trip on Discovery, Prince Sultan told Ibn Baz he had seen the earth and the sun and that Wahhabi astronomy was wrong. Ibn Baz could not defy a member of the royal house. Prince Sultan has affirmed that the new preservation enterprise will reflect a dedication to "a manner that serves . . . Islam; besides preserving those sites as an integral part of the great history of our religion." But throughout its history, the Saudi regime and their Wahhabi partners have acted as if they hate Muhammad and Islam. European chroniclers of the Wahhabi movement in the 19th century described the phenomenon as a rebellion against Islam altogether. The most obvious reason for the promised new turn may be that it is part of King Salman's commitment to austerity and a reduction of the Saudi dependence on energy income, with the price of oil falling. To propel economic diversification, the king may hope that tourism in the kingdom will expand. A less obvious motivation may be a desire to adequately shield Mecca and Medina from terrorism. King Salman holds the title "Custodian of the Two Holy Mosques," but his position was challenged internationally by the July 4 bombing near the Prophet's Shrine in Medina. Outrage over the failure of the Saudi rulers to protect Mecca and Medina has led leading Indian Sufis to call for the liberation of Hejaz, the Arabian province in which the cities are located. In the past, the Saudi royals reined in the Wahhabis when necessary. Given the threat of ISIS, such an action is once again needed, and the conflict over the preservation of Islamic heritage cannot but dramatize the situation profoundly.